This dish is packed with fresh flavours and colours, and takes just minutes to cook using chicken mini breast fillets and a jar of sweet and slightly hot Pimientos del Piquillo peppers. Use the fruity, rich Waitrose Extra Virgin Olive Oil from Umbria for maximum flavour, and serve with couscous to soak up the delicious juices. Place the couscous in a pan with 200ml of boiling water. Bring back to the boil, then remove from the heat. Cover and leave to stand while you cook the chicken. Heat 2 tablespoons of the oil in a large frying pan. Add the chicken fillets and cook for about 8-10 minutes, turning occasionally, until the chicken is golden brown. 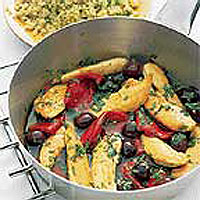 Reduce the heat and add the peppers with their juices, the olives, lemon juice and remaining olive oil. Simmer everything together for 5 minutes until the peppers are piping hot, the chicken is thoroughly cooked, there is no pink meat and the juices run clear. Roughly chop the mint, reserve a little for the garnish and stir in the rest. Return the couscous to a low heat, stir in 2 tablespoons of the chicken juices with the reserved chopped mint. Fluff up with a fork and heat until piping hot. Serve the chicken on a bed of couscous. Chop the fresh mint at the last minute, so that it stays bright green - the cut leaves darken to black over time. This recipe was first published in February 2004.